MALACAÑAN – Department of Trade and Industry (DTI) Secretary Ramon Lopez revealed year-long plans that aim to complement and heighten the impact of the country’s strategic priorities and deliverables for the ASEAN Economic Community (AEC), following DTI’s chairmanship of the ASEAN Economic Ministers (AEM) meeting and the ASEAN’s Committee on Business and Investment Promotion (CBIP). QUEZON CITY – The Human Rights Victims Claims Board (HRVCB) agreed to the demand made by SELDA (Samahan ng Ex-Detainees Laban sa Detensyon at Aresto) and human rights victims to start distributing the reparation and speed up the processing of claims of martial law victims during a meeting with Pres. Rodrigo Duterte on January 19 in Malacanang. SELDA sought Pres. Duterte’s intervention to expedite the process of recognition and indemnification of thousands of victims who toppled the Marcos dictatorship in 1986. Leaders and officials of SELDA met with the President for the first time on Jan. 17 at the Palace. 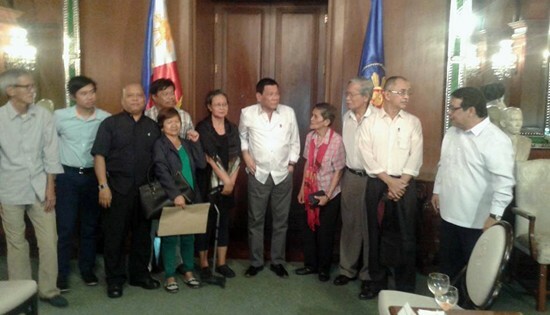 They told the President that despite the passage of the reparation law four years ago the victims, many of whom are old and ailing, have yet to receive recognition and compensation. Worse, the Board has processed only 30,000 applications, not even half of the total 75,000 applications. “This snail-paced system that has been the practice of the Claims Board for the last three years which could remain unfinished until the sunset year of the Board’s tenure in 2018 is victimizing the already-victimized victim,” commented Marie Hilao-Enriquez SELDA Chair who attended the said dialogue. Pres. Duterte agreed that indeed the processing is to slow and summoned the Board to speed up the processing and distribution of the compensation funds for the victims. At the January 19 dialogue called by President Duterte between the HRVCB and SELDA, human rights victims scored a victory when the HRVCB agreed to expedite the reparation and recognition of Martial Law human rights victims. The HRVCB will partially award in advance the indemnification of the already approved applicants of human rights violations victim claimants numbering in thousands as of January 18, 2017. It is also agreed that the partial indemnification shall be done within a sixty days period. Consequently, non-monetary reparation will also be made available for the victims who seek assistance from Department of Health (DOH), Department of Social Welfare and Development (DSWD) and TESDA. “Though the victory is incomplete and partial, it gives hope to the victims who are already old and ailing. SELDA will continue to press for the speedy processing of the remaining forty-five thousands applicants so that justice and indemnification to the victims will be rendered”, said Enriquez. Also, SELDA assures to help the HRVCB in the processing of the partial payment and other requirements that entail coordination. SELDA expressed deep concern on the high fall rate of invalid applicants out of the initially processed 30,000 of which only 9,000 were approved. Likewise, it will also look in to the validity of the Claims Board statement that only 3,000 Hawaii claimants had applied for reparation and recognition out of the original 9,539 class action suit members. It must be recalled that the Hawaii Claimants were accorded conclusive-presumption according to the law (RA 10368). Justice must be served to all Martial Law victims who were recognized by law when the Republic Act 10368 was signed and approved into law in February 2013. However, the Human Rights Victims Claims Board(HRVCB), takes a slow pace in processing the 75,730 applicants since it was created in 2014. No less than the President Duterte himself, during the January 17 dialogue with SELDA officials and leaders stated that the slow paced reparation process and recognition is a violation of the law itself and an injustice to the thousands of victims of Marcos martial law. He also promised to expedite the process. Likewise, President Duterte and SELDA agreed that there should be an immediate and advance reparation for the already approved claimants. During the last dialogue, the HRVCB agreed to write the Commission on Audit (COA) to seek for an exemption on the publication of the accredited claimants to hasten the advance and partial compensation. According to the law, it is required that only after processing all the total claimants and its approved list in order that the awarding of monetary and non-monetary compensation could commence, there should be publications of accredited lists of claimants in three consecutive weeks on broadsheet newspapers. At present, the Claims Board had already spent P136.17 M for its operations from the P10 B allotted fund for reparation. It has fifteen (15) remaining months to complete its tasks and implement the law. SELDA shall also look into the matter of Human Rights Violations Victims’ Memorial Commission which is according to the law should be created which until now is never implemented. The law also stipulates the “The lessons learned from Martial Law atrocities and the lives and sacrifices of HRVVs shall be included in the basic and higher education curricula, as well as in continuing adult learning, prioritizing those most prone to commit human rights violations (n, 27)." SELDA is looking forward to the day that all victims of Martial Law by a dictator, plunderer and human rights violator Ferdinand Marcos will be recognized and given reparation. 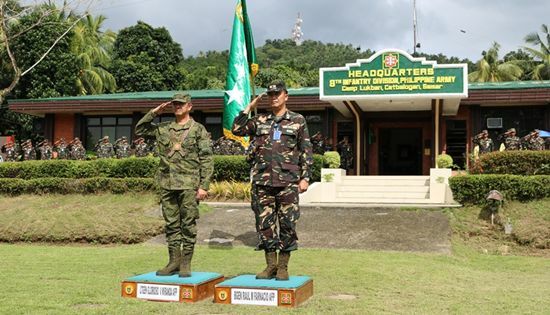 CAMP LUKBAN, Catbalogan City – The Army’s highest ranking officer together with his staff has officially visited the home of the 8th Infantry (Stormtroopers) Division, Philippine Army on January 18, 2017. A full military honor was accorded to Lieut. Gen. Glorioso V. Miranda AFP, Commanding General of the Philippine Army upon his arrival at the Openiano Field and was warmly welcomed by Brig. Gen. Raul M. Farnacio AFP, Commander, 8ID, together with the officers, enlisted personnel and civilian employees of this Command. This was his first visit to 8ID which boosted the morale of the troops to pursue development support to foster the foundation for inclusive and human development in Eastern Visayas. “The strength of the Philippine Army rests on each and every one of us. My function as your Commanding General, or the function of your Division Commander, your Assistant Division Commander or your Battalion Commander is no more important than the function of an individual soldier out there in the squad. Every component of the organization has a vital role in accomplishing the mission. Strength is being defined the way we work together, the way we synchronize our effort, the way we harmonize our skills. Let’s help together to win the peace and prosperity in our country.” Lieut. Gen. Miranda added. QUEZON CITY – Labor group Associated Labor Unions (ALU) lauded President Rodrigo Duterte for approving the other day a one thousand peso increase of pension for 2.3 million pensioners of Social Security System (SSS). “We thank President Duterte for listening to the needs of pensioners. We welcome this as it is an answer to the promise he made to pensioners during the campaign. It will help pensioners to cope with some but not all of the burdens caused by rising prices of basic commodities and cost of services,” ALU spokesperson Alan Tanjusay said. However, the ALU argued that the government should have fixed the system first and institute reforms within SSS before requiring new contributions from 14 million paying members out of the 34 million registered members. Tanjusay said they urge SSS management to institute reforms within the system by trimming down excessive bonuses and introduce reasonable perks to all its top executives, improve its collection efficiency by pinning down non-remitting employers, stop corruption within and act on 7,000 delinquent employers now pending in the courts. “There would be significant improvement in the life fund of SSS if these reforms are enforced. Resorting to quick fix and the path of least resistance raises doubts about ability of SSS commissioners ability to trim corporate fat. We suggest that President Duterte to direct the SSS open their books and consult with workers since its workers money that the SSS is doing placements on,” Tanjusay said. He said the workers’ daily wage purchasing power is reduced by at least 30% in the face of prices of basic commodities and cost of services. There are also impending bigtime increases in the cost of electricity and water utilities. CHICAGO, IL - iManage today announced that the Angara Abello Concepcion Regala & Cruz Law Office (ACCRALAW), a top tier Philippines-based firm servicing local and international clientele, has chosen iManage Work for document and email management. Since its establishment in 1972, ACCRALAW has grown into a celebrated and multi-awarded service organization with over 140 lawyers today. True to its vision of "setting the pace in excellence in the practice of law," ACCRALAW has pioneered the use of technology in the legal profession. "The delivery of legal services should leverage technology. We believe in taking advantage of the latest technology not only to improve the efficiency of rendering legal services but also to reduce cost for the benefit of our clients and to ensure our lawyers have a more conducive environment within which to work," said Atty. Leland Villadolid Jr., litigation senior partner with primary field of practice in Telecommunications and IT and Head of the Firm's MIS Department. "The Firm recognizes the advantages of today's technological advancements. Technology is used exhaustively in ACCRALAW to improve the skills of its lawyers and to render the best legal services to clients at a managed cost. In iManage, ACCRALAW has deployed a sophisticated Work Product Management system that encompasses document management, email management, knowledge management, analytics, process automation and more." In the first few months of going live with iManage Work, ACCRALAW has already experienced significant benefits. iManage Work integrates seamlessly with ACCRALAW's existing practice management system, so that when a new matter is created, a workspace is automatically generated in iManage Work, without the need of manual intervention. Within minutes, users can start saving and publishing documents to this centralized repository, allowing anyone connected to the matter to search, access, and view the related files -- saving valuable time and enabling more efficient collaboration. iManage Work has been rolled out across all of the Firm's practice departments. As a result, the Firm can better carry out work on behalf of its clients in areas ranging from Litigation and Dispute Resolution, Corporate and Special Projects and Intellectual Property, to Labor, Tax and other specializations. Before deciding on a Work Product Management system, ACCRALAW exercised due diligence by visiting several legal firms in neighboring Malaysia that were iManage customers, to hear their opinions first-hand. "We talked to our peer firms about iManage, and the feedback we got was very positive," said Atty. Emerico O. De Guzman, the Firm's Managing Partner. "As we got deeper into the evaluation process, we saw for ourselves what iManage Work could do and the way it could make our professionals more efficient." iManage partner Business Network Solutions (BNS) – headquartered in Malaysia, and serving Southeast Asia – assisted ACCRALAW with their implementation of iManage Work. The entire process – from information gathering, to go-live date -- was completed in approximately four months. "Forward-looking firms like ACCRALAW pay attention to what other firms are using to help their busy professionals get work done more effectively," said Dan Carmel, iManage chief marketing officer. "With iManage Work, ACCRALAW is now using tools designed for the modern workforce to improve productivity, make better decisions, and work smarter." 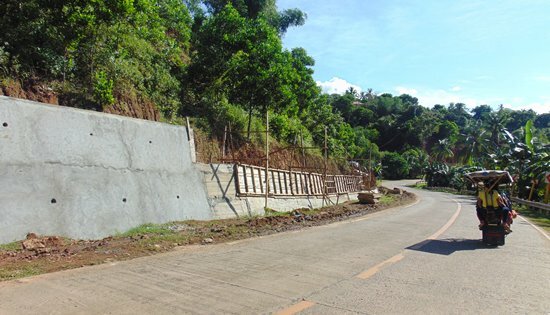 Completed Construction of Slope Protection along Naval-Caibiran Cross Country Road (NCCR). The project is under contract with Chu Construction with a contract cost of P41,600,000.00. The above road section is prone to flooding hence drainage structure was included in the Slope Protection project. Other than the slope protection structure and drainage, concrete paving is also included in the project. The completed project will provide a structure that will prevent further landslide along this road section and contain run-of water during rainy days to prevent future damage to existing paved National Road. NAVAL, Biliran – The Department of Public Works and Highways (DPWH), Biliran District Engineering Office (BDEO) ends the year with high accomplishment posting 91.84% surpassing the 85% district target set by the DPWH Central Office. Biliran DEO has been allotted P683.745M under FY2016 DPWH Infrastructure Program with 66 projects. David P. Adongay Jr., District Engineer revealed that out of the 66 lined-up projects, Biliran DEO completed 62 projects, with four remaining projects on-going under the Regular Infrastructure Program. Adongay previously reported that these remaining projects encountered delay due to inclement weather condition in the Province of Biliran that hinders the contractors to smoothly perform their operation, and other problems such as the acquisition of Road-Right-of-Way (ROW). These projects are the P45M Construction of Slope Protection along Biliran Circumferential Road (BCR); P45M Construction of Biliran Diversion Road including Slope Protection and ROW; P8.7M Replacement of Banlas Bridge along Maripipi Circumferential Road; and the P5M Repair of Biliran Bridge along Leyte- Biliran Road. Adongay said that those remaining projects will be spilled over on the 1st quarter of 2017. “We need to fast-track on our implementation of projects pero hindi ibig sabihin na pag’ inii-speed natin yung ating implementation ay mawawala na yung quality, speed and quality of projects should go together," Adongay reminded during the last day of work on December 29, 2016 during the flag retreat. Adongay was recently awarded as Best District Engineer at DPWH Regional Office Baras, Palo Leyte on Dec. 21, 2016 for his invaluable support and high degree of commitment in all the undertakings of the Regional Office and for consistently rendering his superior performance in the attainment of the Department’s Mission, Vision and Strategic Objectives. Moreover, Biliran DEO ends the year garnering the awards as Best in Planning and Design Section (PDS), Best in Financial Management Section (FMS) and Overall Best District Engineering Office out of 13 District Offices in Region VIII. QUEZON CITY – The AFP and DND should disclose the actual contents of its new campaign plan, Development Support and Security Plan Kapayapaan, that was launched last week at a top level command conference. If it is a sequel to Oplan Bayanihan, claiming to put primacy on the peace negotiations and so-called non-combat "development" work, but continuing the militarization of communities, then it is not new nor will it succeed. Will DSSP Kapayapaan cause the pullout of troops from Lumad and other occupied areas? Will this cause the suspension of military operations masquerading as non-combat, development operations in civilian communities? Will this end the "IP-centric" approach adopted by Oplan Bayanihan that has resulted in human rights violations in indigenous communities? Will this make the AFP stop targeting legal activists, whether through trumped-up charges or by extrajudicial killings? Will the AFP disband paramilitary groups especially those most notorious for rights abuses such as massacres? If the answer to all these questions is NO, then we are in for more of the same. Maybe even worse. Oplan Bayanihan of Aquino also claimed to recognize the primacy of the peace process but instead unleashed war on the people. It was an utter failure as the peace talks were stalled while the AFP failed to stop the advance of the revolutionary forces. It is this reality that served as the basis for the Duterte government to enter into peace talks with the NDFP. Government cannot defeat the revolutionary forces because the social, economic, political and historical basis for the armed conflict remain. The root causes of armed struggle must be addressed. The AFP should upload and make available the new DSSP Kapayapaan to allow its scrutiny by all stakeholders and interested parties, including human rights groups, peace advocates, and members of Congress. Kapayapaan's predecessor Oplan Bayanihan was made available to the pubic by the previous regime and can be found at the AFP's website. The people continue to call for the pull-out of AFP troops operating in civilian communities. These AFP operations undermine even the government's own ceasefire declaration, exposing it as a sham as far as affected communities are concerned. Affected communities have raised many complaints versus the AFP and hope that these will be discussed during the 3rd round of formal peace talks that will begin on January 19, 2017. MAKATI CITY – Following President Rodrigo Duterte’s directive to replace the “5-6” money lending system and provide an affordable micro-financing for the country’s micro, small and medium enterprises (MSMEs), the government’s Pondo sa Pagbabago at Pag-asenso (P3) program pilots this month in Mindoro, Sarangani and Leyte, among the top 30 poorest provinces, to represent Luzon, Visayas and Mindanao, the country’s trade chief said. P3 allocates P100 million for direct lending by SB Corp. Target loan beneficiaries are the small enterprises in priority and emerging industries, start-up businesses and technology innovators. Minimum loan amount will be P300,000.00 with interest rate capped at 10% p.a., with or without collateral cover.